Lightning is incredible enough when we see it from the Earth, but seeing it from space? Absolutely phenomenal. 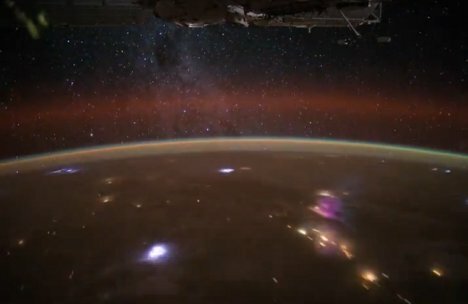 This short video of a lightning storm over Africa was shot on December 29th from the International Space Station. The time lapse shows a sped up period of 15 minutes, ending with a spectacular sunrise. Even more amazing than the lightning storm on its own is the fact that the video also includes a background of the Milky Way. That hazy cloud in the middle of the top part of the shot is the limb of our very own galaxy stretching away in space. If you’re anything like us, you’ll hit “replay” at least a few times to catch every little flicker of light and every swirl of the clouds. See more in Space & Time or under Science. January, 2012.